From October 22--28, ten TFP volunteers traveled to New Jersey to oppose socialist Obamacare. The caravan consisted of TFP members and students from St. Louis de Montfort Academy. 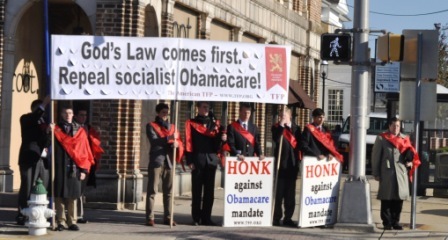 With a banner reading “God's Law Comes First, Repeal Socialist Obamacare!” and signs urging people to honk against Obamacare, the group stood on busy street corners encouraging passersby to reject socialist healthcare. Today we campaigned in Brownville and Eatontown. During the first campaign, a black lady, stopped at a traffic light next to us, rolled down her window and said, “I don't like Obama! He is destroying our country! Thank you all for what you are doing.” She then said that she worked at the municipal county office down the road, and that it was a good spot to do another campaign. Man: “Yeah, I did!” (driving off) expletive…. You idiots need to get a job!" Today we did a campaign in Manasquan and two in Toms River, New Jersey. A policeman walked up to a TFP member and asked what we were doing. After we explained the many campaigns of the TFP, he said, in his New Jersey accent: “I officially can’t disagree with anything you do…” He then took out his phone and started to take pictures. Pointing to the police station, he continued: “If you want to take a break or use the restroom, come on in. There are also some really good restaurants around here if you get hungry.” He thanked us and walked back into the building. Toward the end of the campaign, a man walked up and thanked us for doing the campaign. He mentioned that he lost his job because of Obamacare. The healthcare provider he worked for refused to comply with Obamacare, and closed down. As a result, he found himself out of work. The man was overjoyed to see us, and he thanked us again and left. During the second campaign, a man drove by the campaign. He was so mad that he was crying. He started to spew the worst obscenities, as well as food from his mouth. He said that, “My wife has cancer and was not able to get coverage until this (Obamacare)! So **** you all!” The entire time he was spitting food from his mouth and shaking. He then sped away as people honked behind him to move. Today we also saw some of the damage of Hurricane Sandy. We drove down a five mile strip of road directly next to the coast, and every single house was damaged. Many were put on stilts for major repairs, and others were catastrophically damaged. Some driveways led to houses which are no longer there; they were totally destroyed. Although most of the houses are almost finished being repaired, it was quite sobering to see the damage; more sobering still to know that this was only a small part of the damage! After dinner at a restaurant near the hotel, a couple in their sixties saw us pray after the meal. As we went to pay the bill, they grabbed one of our volunteers and gave him a coupon to put towards the meal. Today we went to Browns Mills and Berlin, New Jersey. After the campaign, we walked back to the van and packed up to leave. Two blocks from the site, we pulled into a parking lot to turn around. We then noticed that a man was running towards the van; however, we then realized that we had seen him where we had left…three blocks behind. He ran three blocks to catch up with us! He approached the van to thank us. He was enthused with the campaign and talked for a while. After a few minutes he thanked us again, we bade him goodbye and gave him a flyer, Confronting Religious Persecution in America. Today we did a Traditional Marriage campaign in Berlin, New Jersey. We unfurled the banner, “God's Marriage = 1 Man + 1 Woman,” and held signs encouraging passers-by to “Honk For Traditional Marriage, 1 Man + 1 Woman!” We immediately noticed that there was a much smaller volume of honks in favor of the campaign. We also received a few violent reactions against the campaign. Most of the them were profanities. During the second campaign, against Obamacare, a couple drove by, honked, and parked. They thanked us for what we were doing. “Are you all hungry,” asked the wife, “because you all can come over to our house for spaghetti, if you like!” We heartily accepted, and after the campaign, we were treated to dinner by the kind family. To finish the caravan we did two final campaigns on the way back to Pennsylvania. All of us wish we could continue the fight, but we must return home for now. May we all have the protection from Heaven to weather the crises. No matter what, we ask the grace to stay faithful. May Our Lady protect America against the scourge of socialism.